Religious Debate Forum Warning: The posts/threads contained in this section of the forum can get heated. Terrible. Major renovation work was under way. Let us all pray this was accidental. I would not want it to be the work of a competing religion, bent on our destruction. Am I clear enough for you? Just got home, opened my computer and saw this. I'm sick to my stomach and in shock. The French newspapers are saying it's probably related to the renovations. I've been to Paris twice, and yes toured the Cathedral. First time before 911, then again after. Don't recall any real security there, because after all it's a church. It's also pretty open outside the square with a gazillion tourists in and out all day. Bob can probably say more as I know he's been there as well. None of us do, but the EU and France in particular have not only allowed themselves to be infected with the cancer of Islam, they have embraced it as a new way of life. We lock our doors and guard our property for a reason. There are those that wish to take and destroy. Time for the EU to do a gut check. I'm on a Facebook group, still safe from Zuckerberg's wrath. Everyone yelling that it's the same Islamic group/person responsible for the recent attacks. Coincidental that this begins during Holy Week? Jesus Christ’s Crown of Thorns saved after firefighters and police form human chain. Exactly the point of my comments in my post in this thread. The timing? Makes you wonder doesn't it? There is speculation going around as to what is in this photo. I've read everything from " that looks like a man standing there" to - "it's a miracle", " that's Satan"
For all the statues that are on and around the spire, I'd think it was one of those, but supposedly they removed them all during the renovation. Just to double check that this wasn't a photoshopped thing going around, I've checked several news sources with several photos of the front of the cathedral. It appears to be in every one. The charred remains of the interior that was leaked this morning. 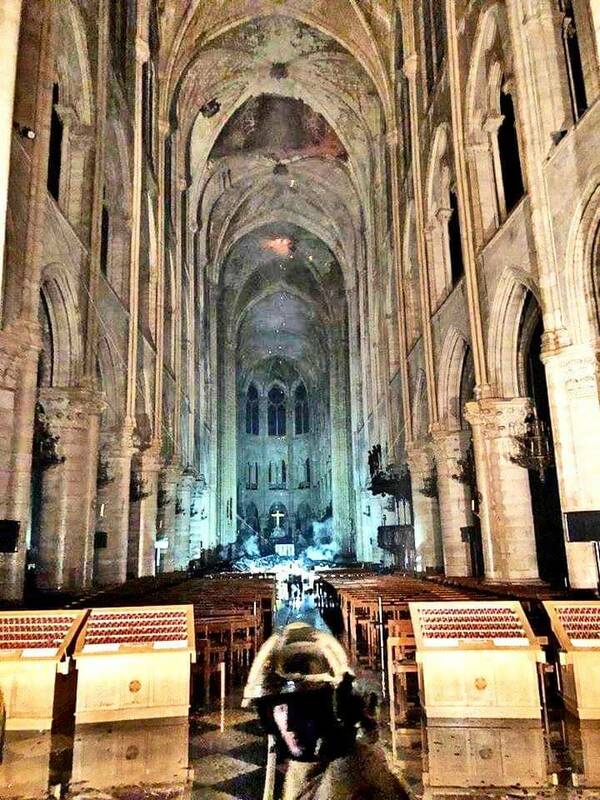 This just in on CNN, all the Democrat hopefuls are now demanding that France rebuild the Cathedral as a mosque. Pelosi and Schumer are introducing resolutions in Congress stating that this fire was all Trump's fault. Stay tuned for more developments as they come in.